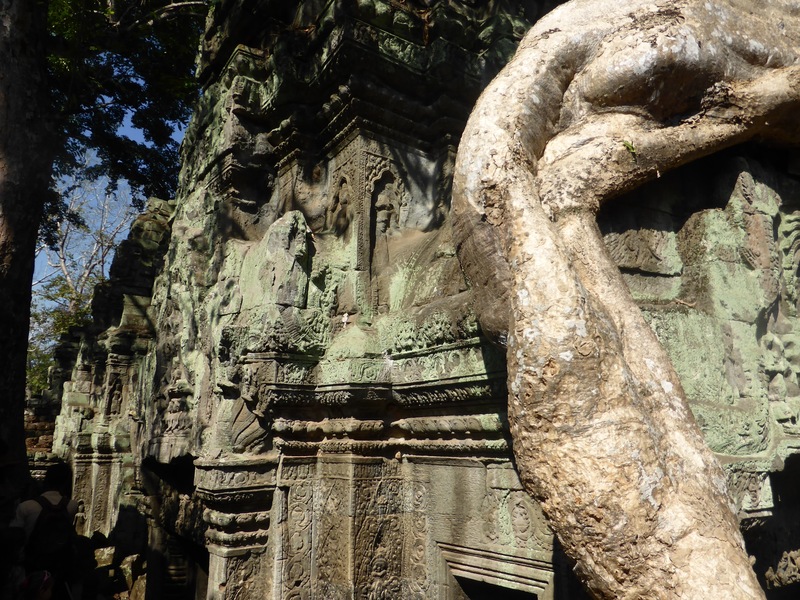 What makes travel to Siem Reap really special? It is the gateway to magnificent Angkor Wat, yes, and it is also a bustling city that is chock-full of responsible initiatives! 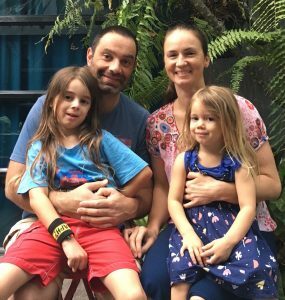 Supporting sustainable businesses and social enterprises with our travel income was very important to us, and it was very enjoyable and easy to do. 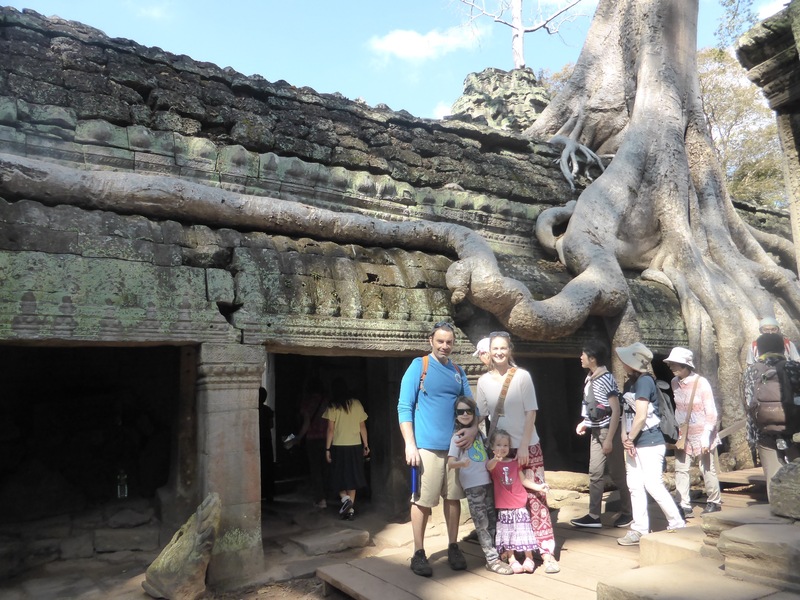 Anyone can do it and have a great time seeing the sights of Siem Reap. And if we all do, together we are ensuring that our tourism has a positive effect on the future of its people. 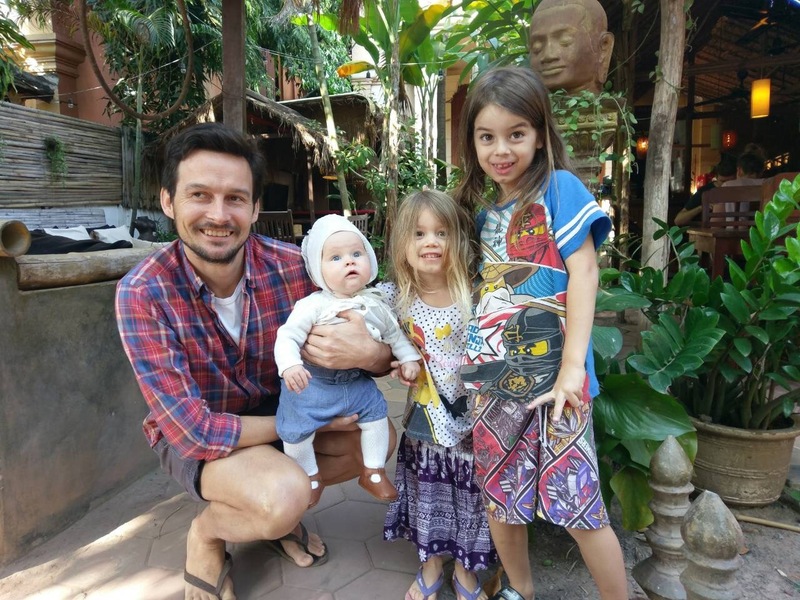 We spent the Christmas and New Years period in Siem Reap, and we loved it there with its bustling atmosphere, friendly people and huge range of activities. And we had a wonderful couple of weeks exploring the region with our kids. Most people visit Siem Reap to explore Angkor Wat and the temples surrounding it, and as it is so popular, tourism is the major industry. It is excellent to find so many sustainable programs there, whose aims are to use tourism to help marginalised Cambodians gain skills and knowledge for their future. Siem Reap continues to be one of the poorest areas of Cambodia despite all the tourists flocking there each year. For this reason also, we believe it is vital to support local people and not big organisations who make profits while the majority are struggling. If these ideals are important to you too, read on for our recommendations on how to travel responsibly, sustainable places to stay and eat, and responsible activities throughout the region. If you’re planning a trip to Cambodia, be sure to check out our travel insurance provider, World Nomads. 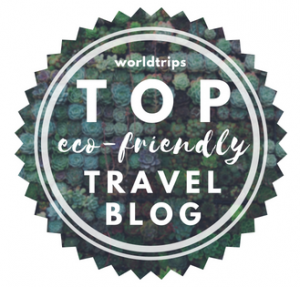 They support responsible tourism, are super-flexible and helpful, and as a customer you can make a micro-donation to one of their community development projects too. 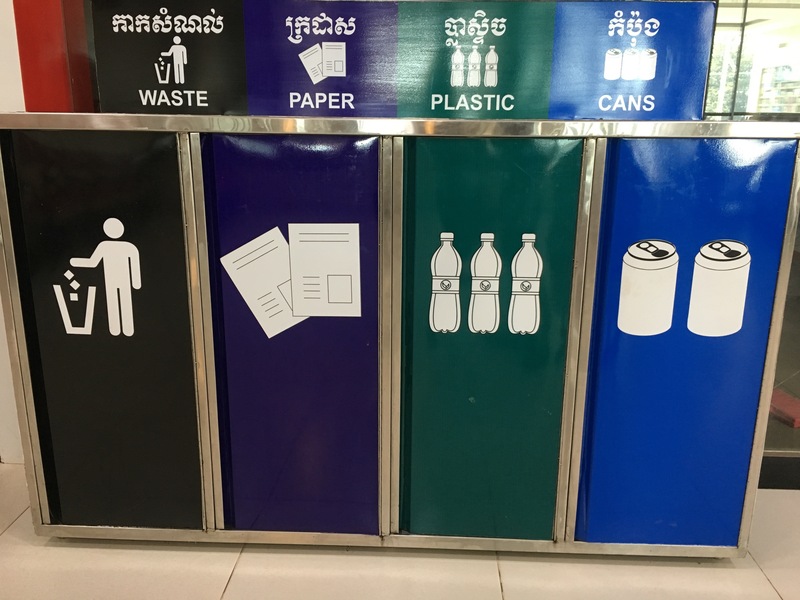 All throughout Cambodia, management of waste is a big issue. It is heartbreaking to see so much rubbish constantly on the streets and even in the natural areas. Trash is often burnt by villagers to get rid of it, but this is not a great solution as many chemicals are then released into the air around them. Being a responsible traveller in Siem Reap definitely means minimising your own trash. There are some great recycling programs that you can support, and taking your own reusable bags with you is an easy way to reduce plastic bag use. 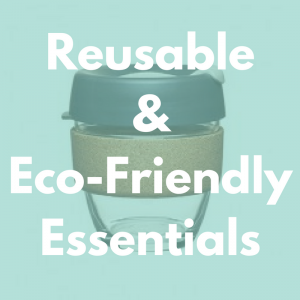 Plastic Free Cambodia have some great resources and tips on their website, too. 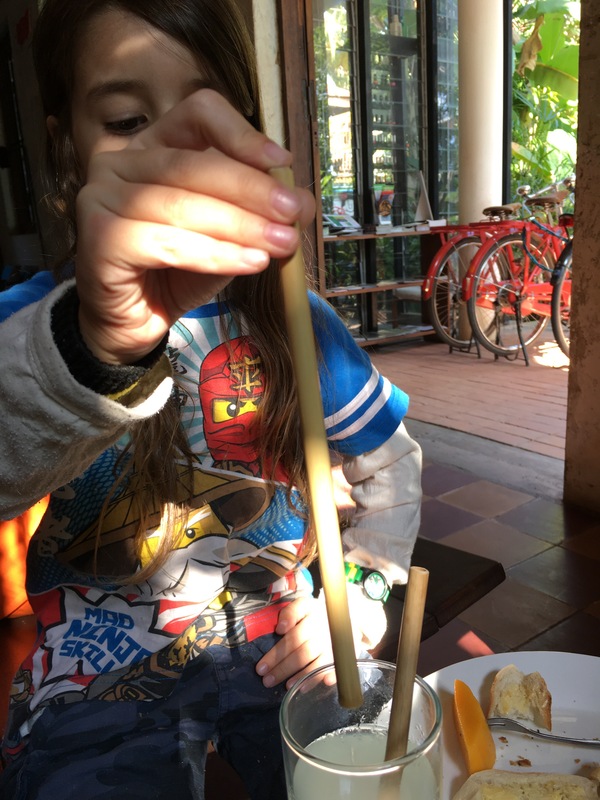 There is also a small business that makes reusable straws from bamboo in Siem Reap. Many cafés use their straws, and you can buy them and take them around yourself too. Using them instead of plastic straws seems like such a minor thing, but straws are a major polluter and take many years to break down. 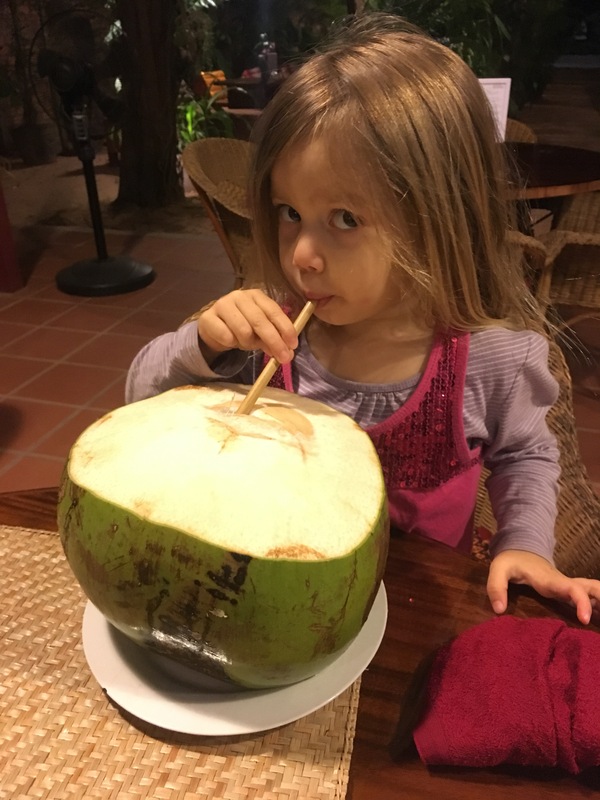 We were pleased to find that many cafés and restaurants offer filtered water refills in Siem Reap. Taking a large stainless steel water bottle with you everywhere is a great idea to cut down on the need for plastic water bottles. We also took our own water filter with us but we didn’t use it much, as water refills were so easy to find. You can find refill stations through the Cambodian Refill Not Landfill initiative. Not supporting illegal wildlife trafficking and poaching, by eating meats or buying souvenirs from rare and endangered animals. The pangolin and wild elephant are in critical status, and populations of monitor lizards, wild pigs and deer, tortoises, bears and snakes are also threatened by these practices. Being mindful of your use of resources such as electricity and water. Always asking before taking photographs of other people. Read more about why here. Not visiting orphanages. Children are not tourist attractions, yet many institutions are treating them as such: it is not classified as a modern form of slavery. New research is showing that up to 80% of children in orphanages are not actually orphans, yet the number of orphanages in Cambodia increased 75% from 2005 – 2010. Friends International and UNICEF have launched a big campaign about it, encouraging people to think before donating or visiting to keep children safe, and discouraging orphanage tourism and voluntourism. Read more about it in this post also. Excellent initiative ConCERT Cambodia has some guidelines for responsible volunteering that are useful to think about, as well as answers and suggestions for other questions you may have as a responsible traveller. If you do want to help children in need, please do some thorough research about this issue, and be prepared to do some work that may not be so heart-warming and photogenic. Supporting organisations that work to keep families together rather than orphanages is a proposed solution. Donating blood is a really great way to make a difference in Cambodia. You might actually save a child’s life with your donation. Dengue fever is often life-threatening to children, and dengue rates are high in Siem Reap yet blood donor numbers are low. Visit the Angkor Hospital for Children any day between 8am – 4pm to donate. They only take 300cc and facilities and procedures are modern. Supporting landmine victim’s bands and other initiatives that empower disabled adults. Not buying items from children working on the streets or at the temples. We found this particularly hard but did stick to it despite their persistence. Although we felt just awful saying no, all responsible travel guidelines ask travellers not to buy from child sellers, as it locks them into the poverty cycle rather than helps their families. 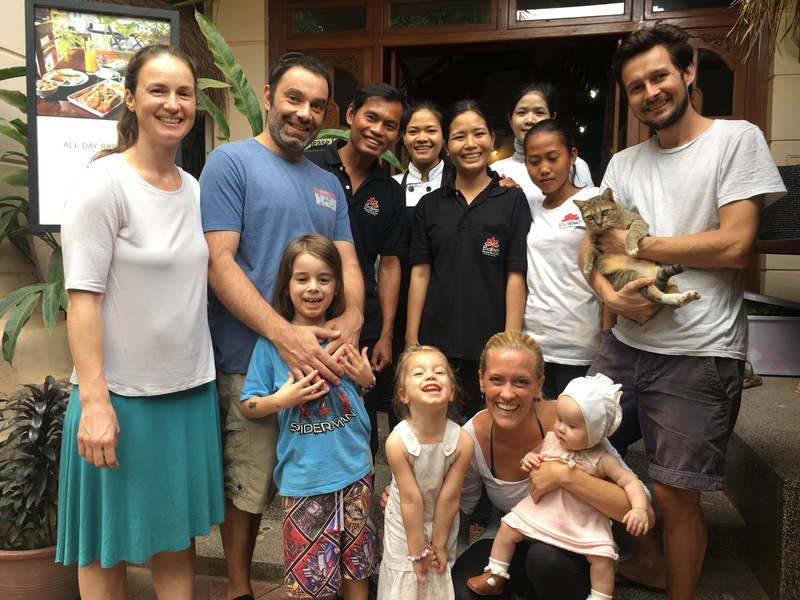 And the easiest and perhaps most enjoyable way to travel responsibly in Siem Reap, is to support the many social enterprises and responsible businesses there. These programs ensure Cambodian people are fairly paid and work in good conditions, and are well-trained and properly skilled for their future. We spent our entire stay at Babel Guesthouse, and we loved it there. Babel runs many excellent social and environmental initiatives, including language and further education for their staff, recycling and plastic bag collection, providing clean water refills and turning used cooking oil into biofuel to power their generator. Babel staff and owners Simen and Katrine, with baby Eline and the cat! 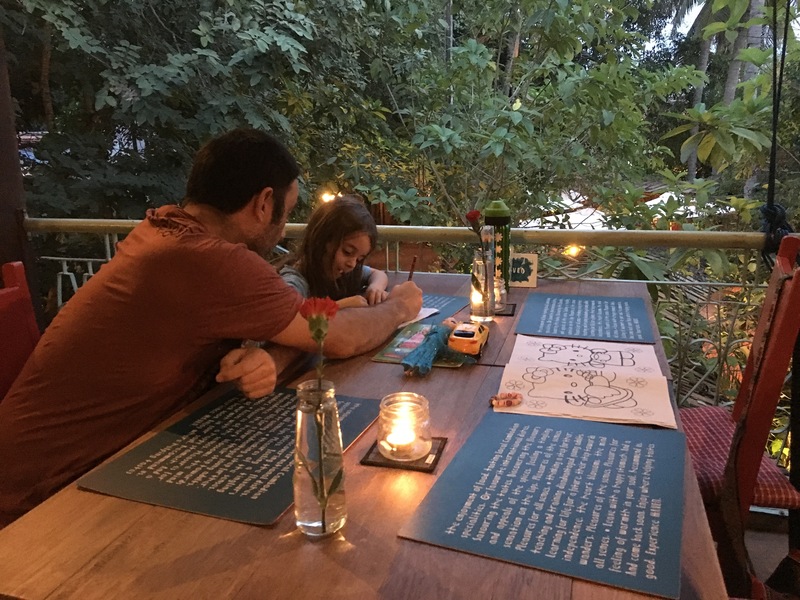 The atmosphere at Babel is fun and welcoming, and their garden restaurant is great to hang out in and chat to the staff and other guests. We always felt safe with our children there, and our kids loved watching movies on the communal tv, helping decorate for Christmas, and playing with baby Eline! If Babel is booked out or not your style, you could try Shinta Mani or Seven Candles Guesthouse. We enjoyed breakfast here several times. Ant confirms that their reputation for the best coffee in town is correct! 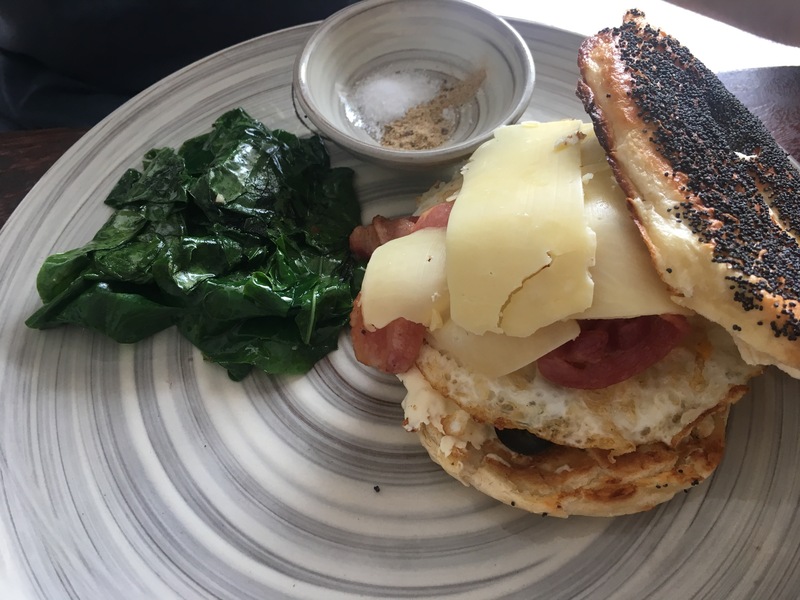 He also LOVED their breakfast bagel, and our kids loved being able to get vegemite with their toast and have a babycino. 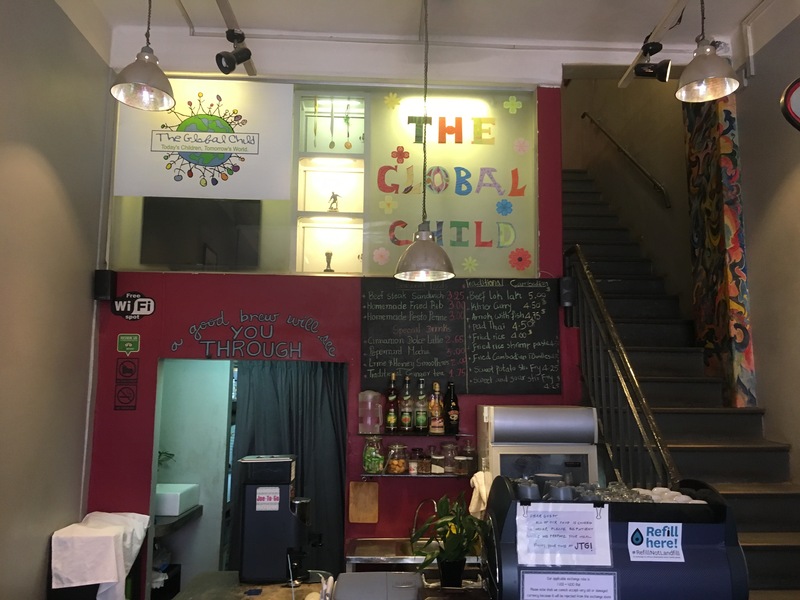 I enjoyed their vegan bircher muesli and being able to get alternative milk drinks, and we all loved the happy atmosphere and great service we received there. We also appreciated their environmental initiatives and programs for their staff. We we only disappointed that they were closed for training on the last day of our stay, as we wanted to go back again! The Little Red Fox Espresso is open from 7am – 5pm every day except Wednesdays. This place is very popular and it was booked out the first few times we tried to visit, so definitely book ahead. 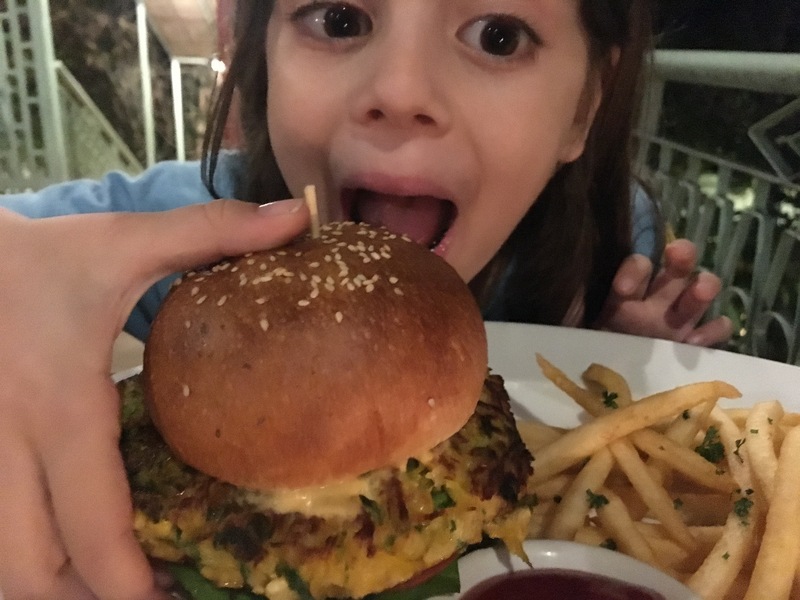 Marum serves beautifully presented and delicious food, and is one of the few places we have found in South East Asia that has a separate kids menu. We spent New Years Eve there and were happy to discover their range of board games too! They made for some extra fun between courses. Marum works with street children and other marginalised Cambodians. It is part of the global TREE alliance of training restaurants which invest 100% of their profits into their students and social programs. Marum also has a great shop on the premises selling upcycled wares and some clothing. Marum is open daily from 11am – 11pm. 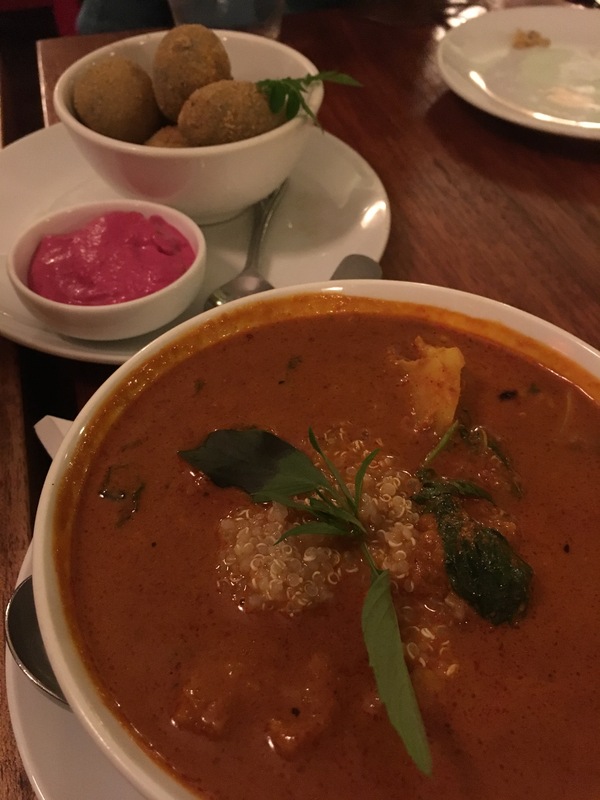 This place is also always busy, and has excellent service and a big range on the menu, including many allergy-friendly, vegetarian and vegan options. The food is fresh, local and organic, and the hearty serves arrive quickly. Sister Srey composts or recycles almost all of their waste, and help their staff with education and participation in further projects in the community. Sister Srey also has a book-swap and small lounge area upstairs, as well as board games and a small clothing boutique. And their menus come inside Little Golden Books, which were great to have a read of while we waited for our breakfast! Sister Srey Cafe is open from 7am – 6pm every day except Mondays. Blossom is one of Bloom Asia’s cafés and training centres for women who have experienced significant trauma. 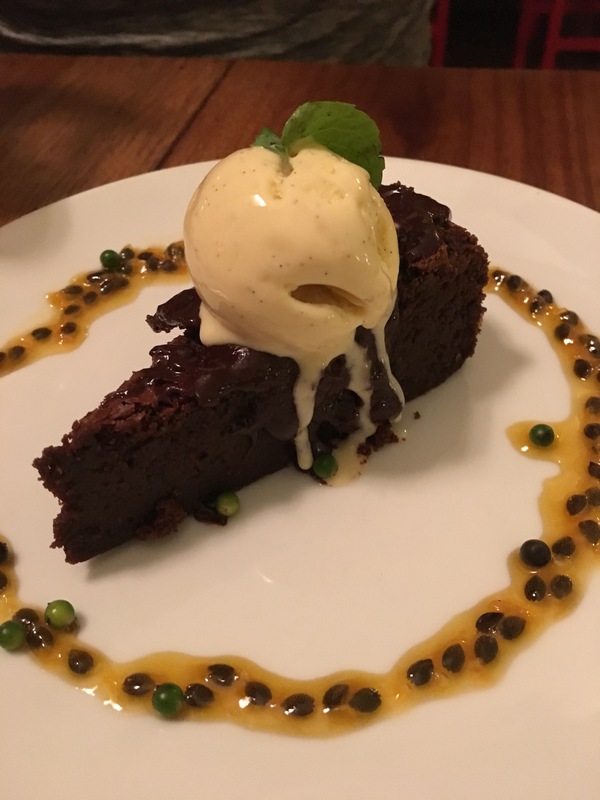 They are non-profits who run a VET hospitality program, where students learn incredible cake artistry and baking as well as computing and literacy classes. All graduates are employed full-time and can also learn service skills and paper crafts. 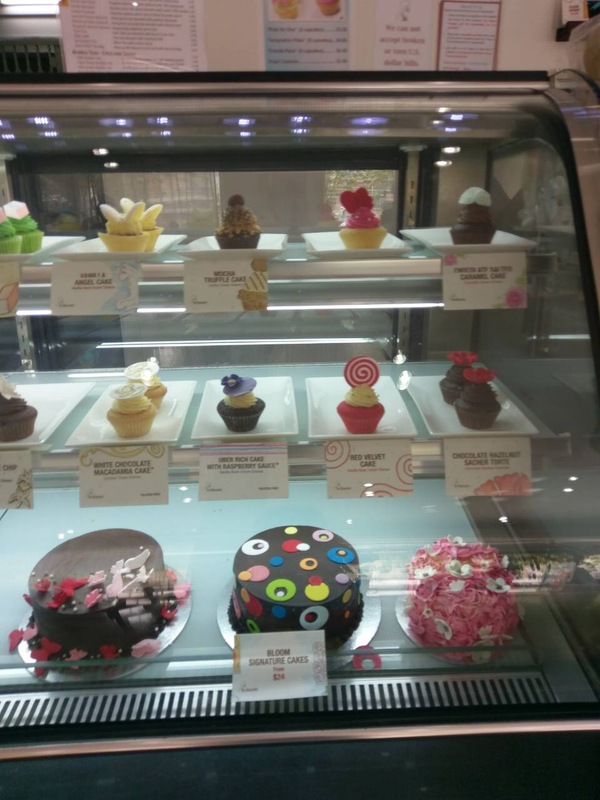 Bloom cafes also serve fair trade coffee and their cakes are absolutely stunning. 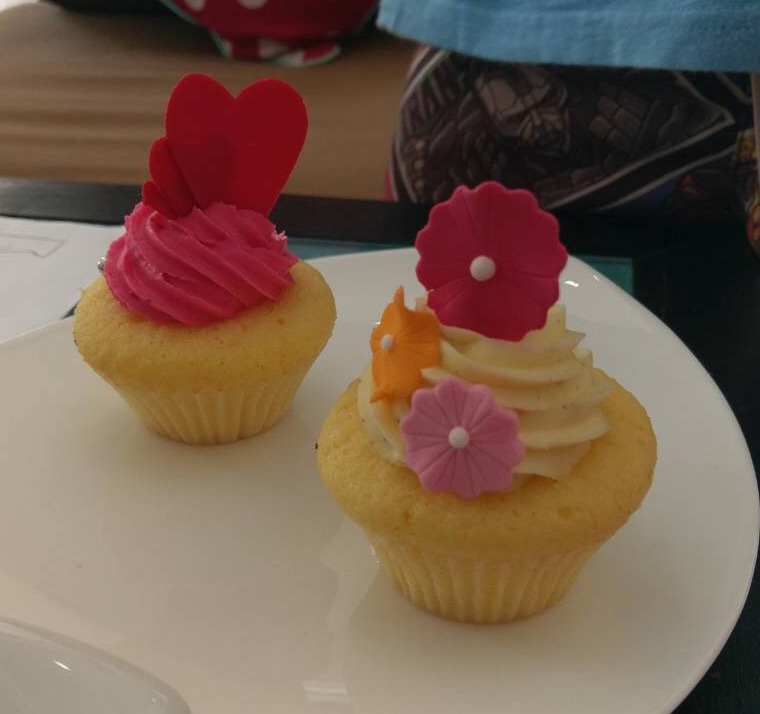 They have been “Baking a difference since 2009” and are wonderful to support if you’re in the mood for some beautiful sweet treats. Blossom is open Monday – Saturday from 10am – 5pm. Another awesome social enterprise and training facility, Haven employs young adults coming out of orphanages, safe shelters and very poor rural communities. Haven takes full responsibility for their student’s financial needs while they are in the training program, which provides vocational and life skills for each young adult. The food at Haven is excellent, with traditional Khmer and Western foods and a great vegetarian range, but no smaller portions for kids. The setting at Haven is beautiful and even though it’s a little out of town, it is very busy daily so book ahead. Haven is open Monday – Saturday, from 11:30 – 2:30 for lunch, and from 5:30 – 9:30 for dinner. We visited Peace Cafe for dinner and breakfast, and enjoyed their fully vegetarian menu. Breakfast there is simple and cheaper than other cafes, and dinner was excellent: fresh and tasty, and Allegra got the biggest coconut we had ever seen to drink! Peace Cafe also has a yoga studio upstairs and a great shop on the premises selling clothes, crafts, jewellery, puzzles and more. They provide holistic training for their staff as well as eco-responsible and permaculture workshops for Khmer people. Peace Cafe is open every day from 7:30am – 9:00pm. 100% of Joe to Go’s profits support a school for former street-working children called The Global Child. 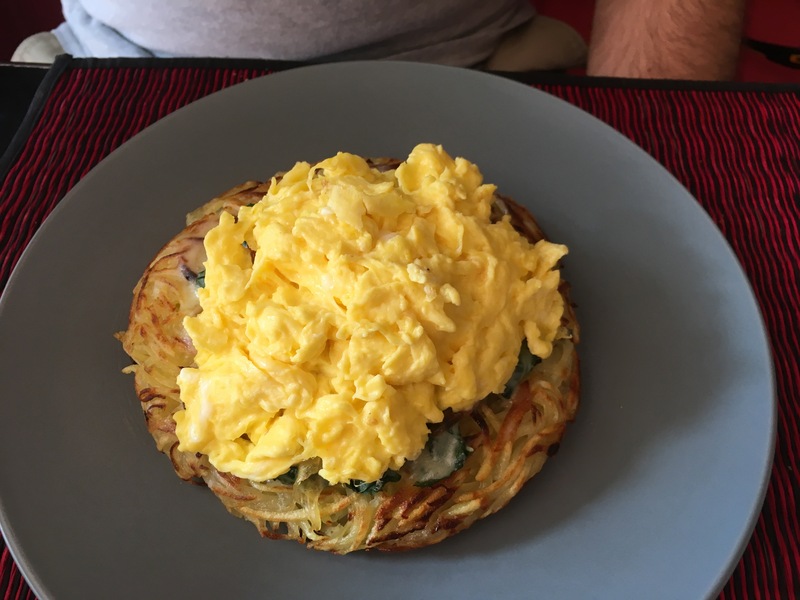 This funky little cafe serves breakfast all day and their huge potato rostis are delicious! We had breakfast here on Christmas Day and really enjoyed their big and tasty meals. Joe to go is open daily from 7am – 9:30pm. We also wanted to try Sala Bai and New Leaf Eatery as we have heard about their great work, but we didn’t get to them this time. 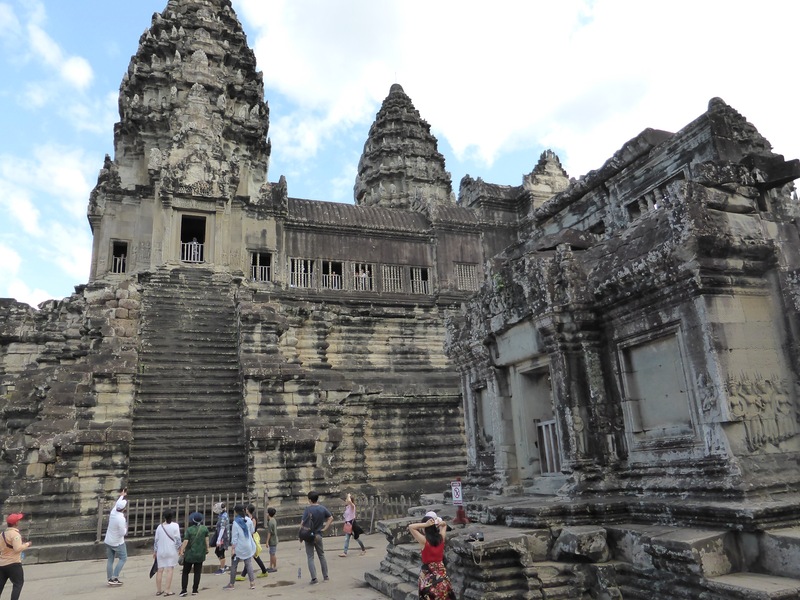 The highlight and main drawcard is of course, Angkor Wat and its surrounding temples. We have heard a lot about it but it still amazed us; how huge the complex of temples really is, how different and detailed many are, and how they have stood the test of time. The temples of Angkor definitely deserve their status as a wonder of the world and major tourist attraction. As so many people visit it each year (more than 3 million!) it is essential to be a responsible tourist, by not leaving any rubbish behind, and by not harming the structures or taking any ‘souvenirs’ from them. We didn’t notice any water refill stations or recycling bins anywhere, so taking your own full reusable bottles is a great idea. It is also important to be respectful by following cultural expectations such as wearing modest clothing, and not pointing your feet at any Buddha or sacred object. It is also best to support local people for tours to Angkor Wat. Most tuk-tuk drivers can take you there, so if you have a relationship with a driver who works for himself it can be a great way to support his family. 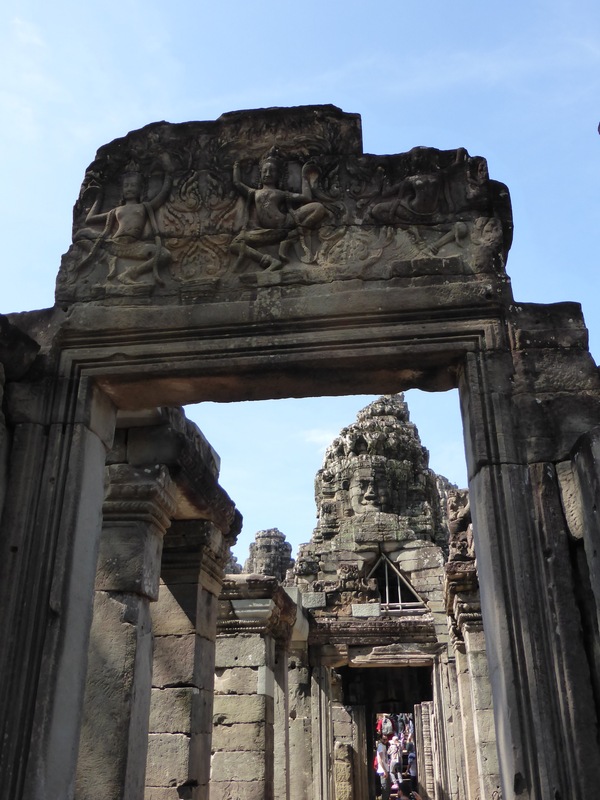 If you want to take a licensed guide along with you (as they must be accredited to enter the temples) you can find one who speaks your language on the Cambodia Tourist Guide website. Many accommodations have their own tours and transport options. We used a tuk-tuk driver named Va who works at our guesthouse, Babel. Va explained the history to us and answered our questions in between the temples. He was knowledgeable and helpful even though he couldn’t go inside with us. If you prefer to book a fully guided tour and transport, there are many companies to choose from. 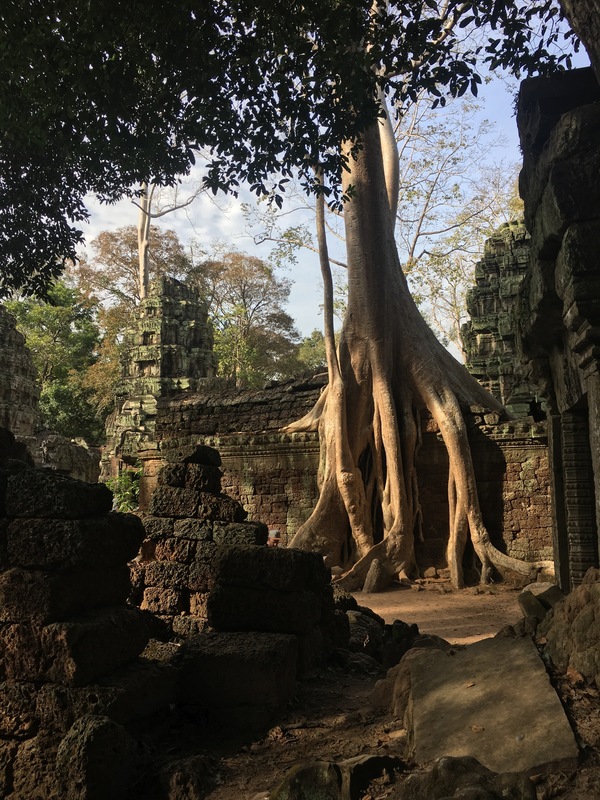 Sustainable or locally owned ones I have researched include Prek Toal Tours, See Cambodia Differently, Intrepid Urban Adventures Siem Reap and Cambodia Local Tours. 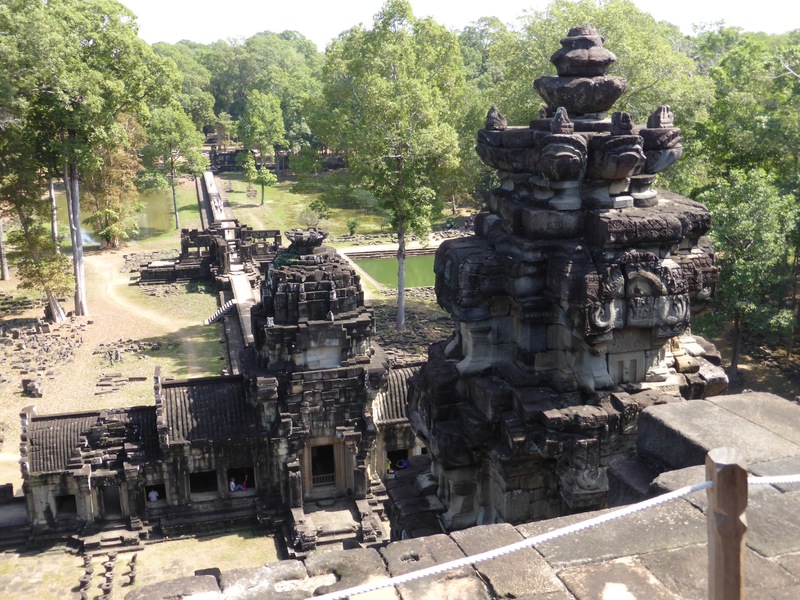 A great sustainable way to see the temples of Angkor Wat (if you’re fit!) is by bike. Many businesses hire bicycles for a minimal fee and you can just ride around yourself, or get a guided tour from sustainable companies Siem Reaper or Khmer for Khmer Organization. You can also hire a Green E-Bike if you don’t fancy pedalling all day, and recharge it if necessary along the journey. And if you like a challenge, you can run a half-marathon around the complex too! Miles Less Travelled blog has a great post about What it’s Like to Run the Angkor Wat International Half-Marathon. The Banteay Srey Butterfly Centre is an example of a new way to provide sustainable income to Cambodian people. It provides training and support to rural communities, which increases knowledge about their local environment and the benefits of conservation. We spent an afternoon there for a friend’s birthday and it was a lovely place with passionate guides to show guests around. 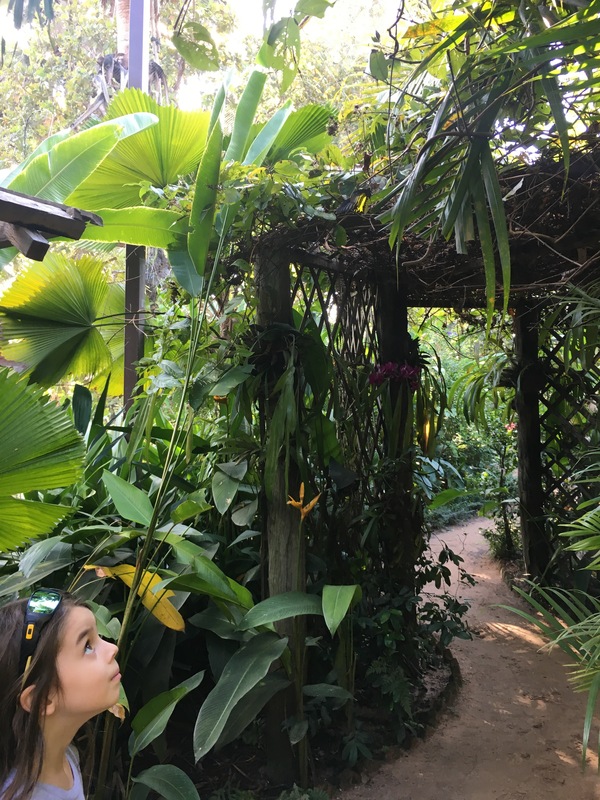 The butterflies have plenty of room to fly around and the gardens are well-maintained and beautiful. One beautiful butterfly that we managed to get a good picture of! 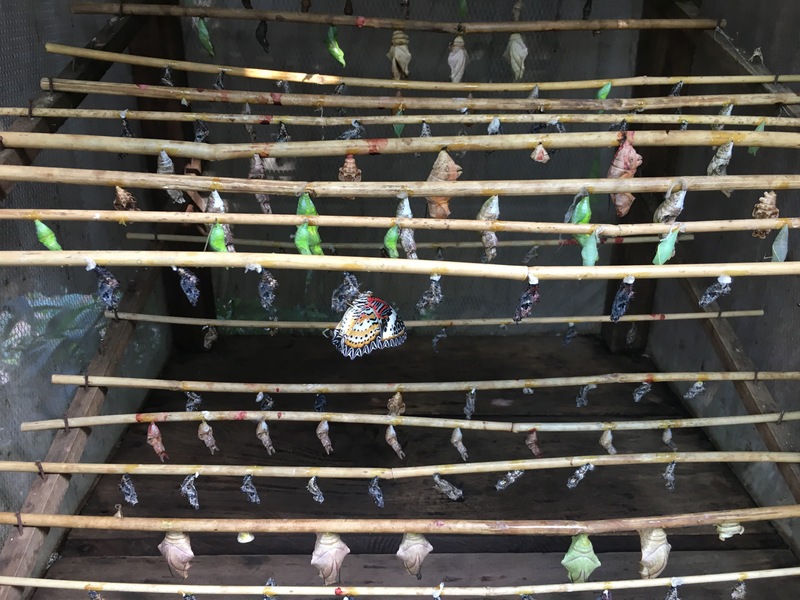 Our kids loved finding different butterflies to watch and photograph, and seeing the cocoons and caterpillars was really interesting too. They also have a small cafe on site. Admission is $4 for adults and $2 for children. Please note this centre is about half an hour out of Siem Reap city. 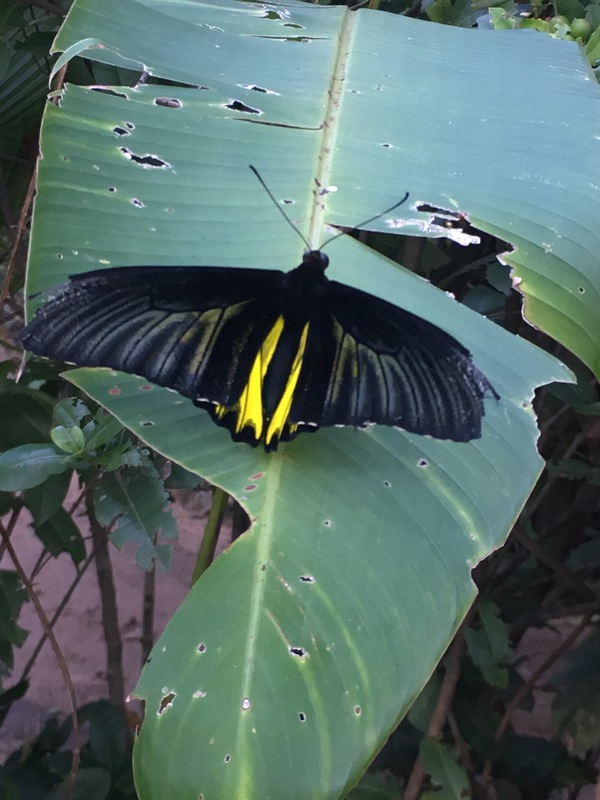 There is a butterfly cafe within the city that we do not recommend, as the facilities were poorly maintained and the garden for the butterflies was very small. I really wanted to do one of these tours but we ran out of time! Tours usually concentrate on the huge Prek Toal Bird Sanctuary and visiting a floating village. The bird sanctuary was created to protect many threatened species and it contains several rare breeds. Now poaching has stopped there are enormous amounts of birds that congregate there in the peak season of December – February, and it’s possible to see smaller numbers from September. There are several responsible companies running tours on the Tonle Sap: Prek Toal Tours is run by locals and invests 100% of revenue back into their community; Sam Veasna Centre runs a great range of nature tours; and Osmose has three different Tonle Sap itineraries to choose from. Relax after a big day out while you marvel at the incredible talents of graduates of Phare Ponleu Selpak, an NGO offering education and professional arts training for free to Cambodian youth. Performers come from various disadvantaged backgrounds to transform their lives through art. This initiative does an amazing job of helping many children have a better life while providing a world-class experience for visitors to enjoy. Phare Siem Reap offers a variety of different performances, all of which combine circus arts with dance, theatre and live music. 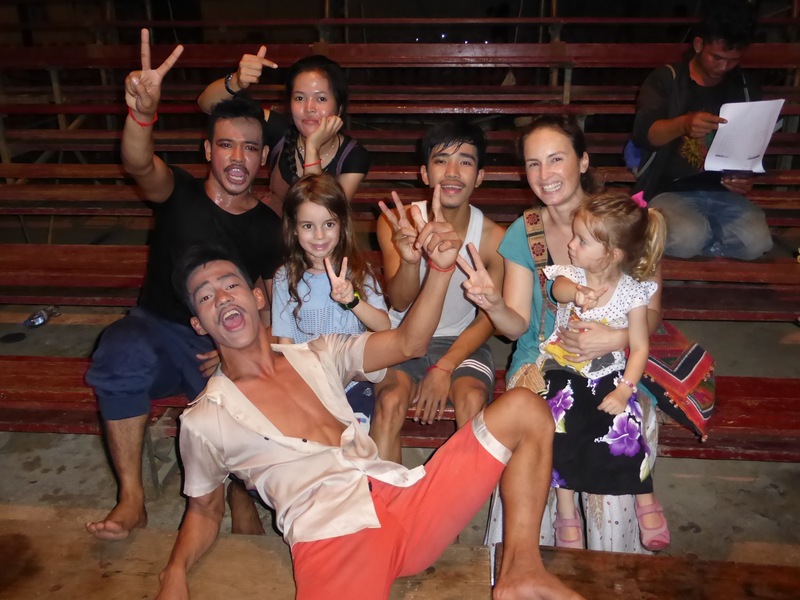 We actually saw a show in Battambang but after seeing it, we all wished we saw one in Siem Reap as well! It was a wonderful night out for kids and adults, and the performers are truly outstanding. We got to meet some of the performers after the show! Older children and crafty adults might like to learn how to crochet with plastic bags. This is a great initiative where mothers of former street kids teach visitors how to make useful items from plastic bags, and write their names in Khmer. We didn’t get to do this but we did notice some of their products in cafes in Siem Reap. Many responsible businesses collect plastic bags to donate to Rehash Trash, so keep an eye out if you’d like to donate any you end up with, rather than add to the litter problem. Backstreet Academy is a new platform that connects visitors with small local businesses, for authentic experiences that support local people. 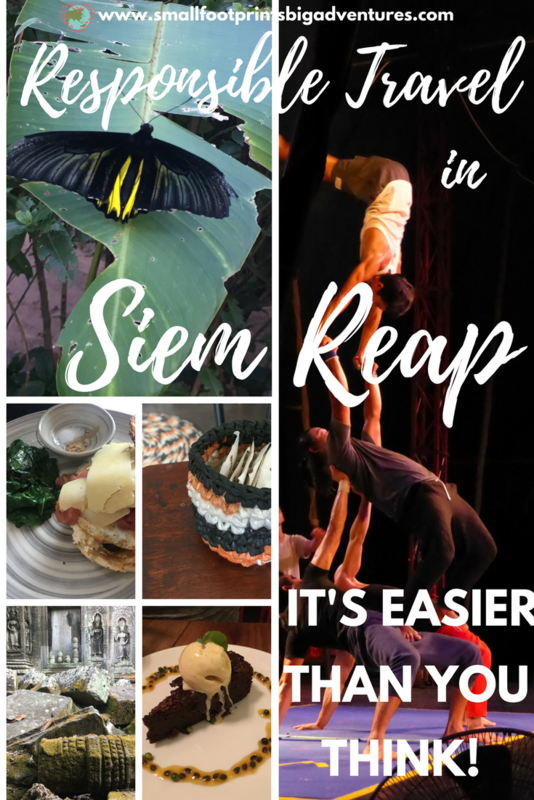 In Siem Reap these include making medieval knives and copper bracelets, stone, leather, soapstone and wood carving, cooking, boxing and dancing classes, traditional rice farming, fishing and hunting, and much more! 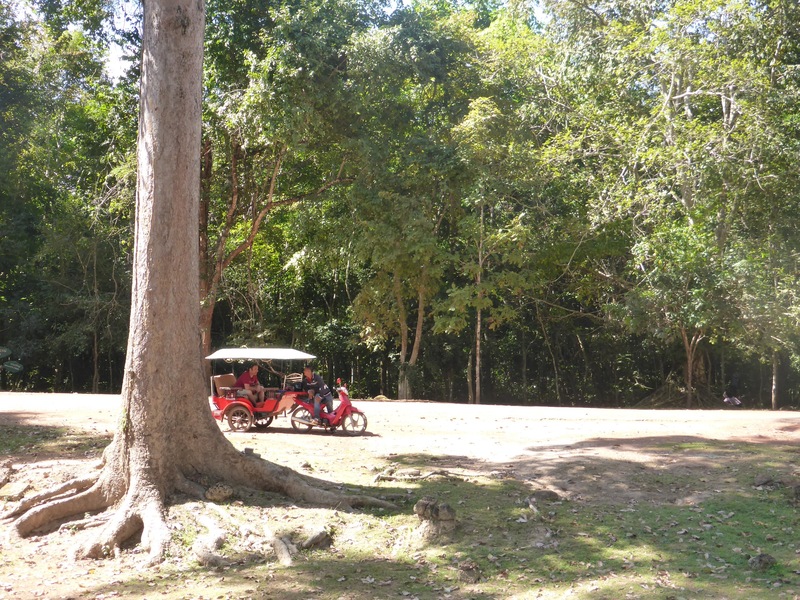 Visit.org and Ayana Journeys also offer sustainable tours to help you learn more about Siem Reap life than the usual tourist trail. Travel deeper with local guides to show you around Siem Reap and beyond, where more ancient temples and friendly villages await. Or take a cooking class or foodie tour around town and get the authentic taste of Cambodia from a knowledgable local guide. 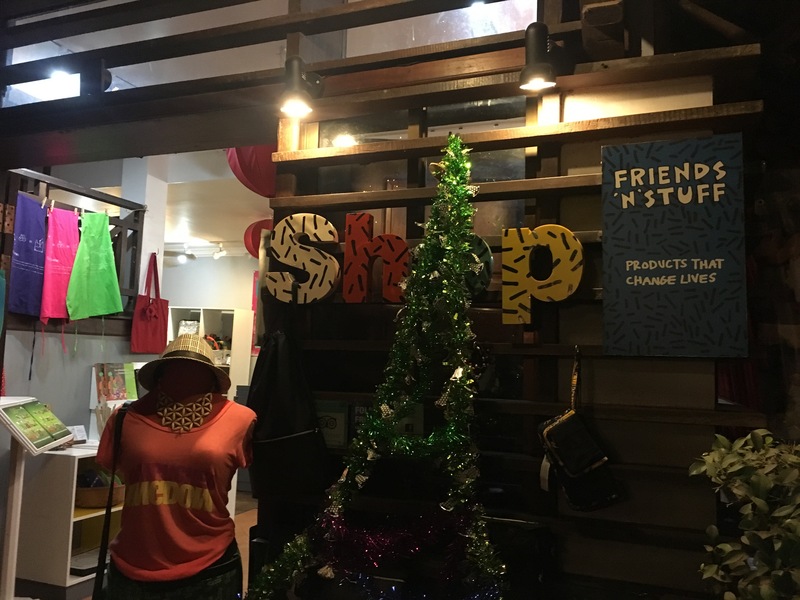 There are many shops and markets in Siem Reap, and some great ones to support have recycled, upcycled and eco-friendly wares. Anywhere you shop, supporting local people is the best way to ensure your tourist money is making a difference to the people that need it most. Sister Srey Cafe which has a small selection of clothing. Peace Cafe which has quite a large and varied store that includes clothing and scarves, accessories, puzzles and bags. Marum which has some upcycled products and a range of t-shirts. We bought some beads made from old magazines, and Allegra and I had a lot of fun making necklaces together from them! 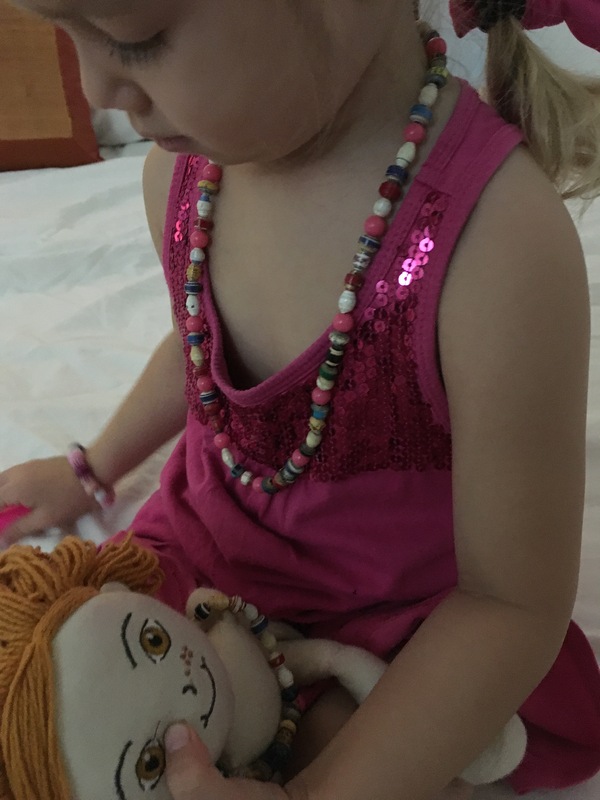 Allegra and her dolly wearing their new necklaces. 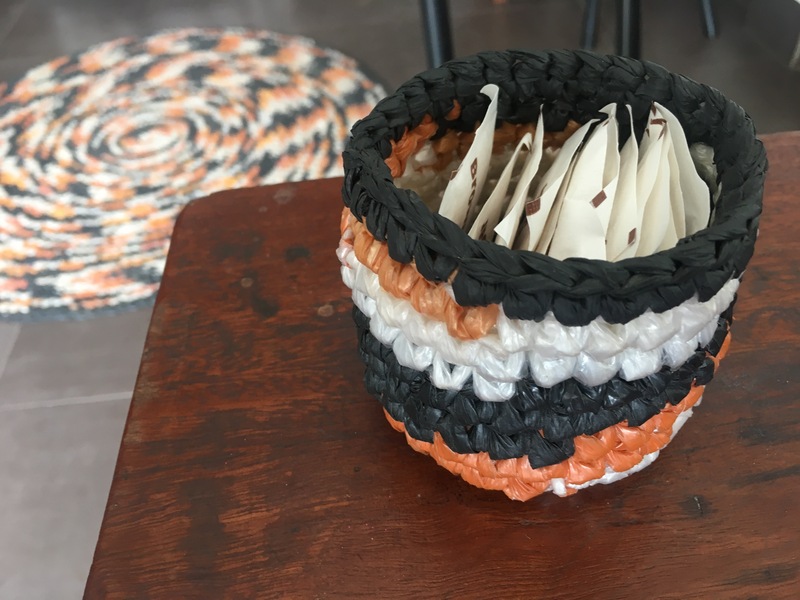 Artisans Angkor produces beautiful homewares, crafts and accessories that keep Cambodian traditions alive, while looking after the environment and their workers in a sustainable manner. Saomao is a social enterprise that produces beautiful scarves and jewellery in accordance with fair trade ethics. Smateria produces amazing bags, purses and accessories from a diverse range of materials, including old fishing nets, reclaimed leather and plastic bags. They are also a social enterprise and take pride in providing a clean and safe workplace, where the mostly female workforce can learn and thrive. They even provide free onsite childcare for staff. 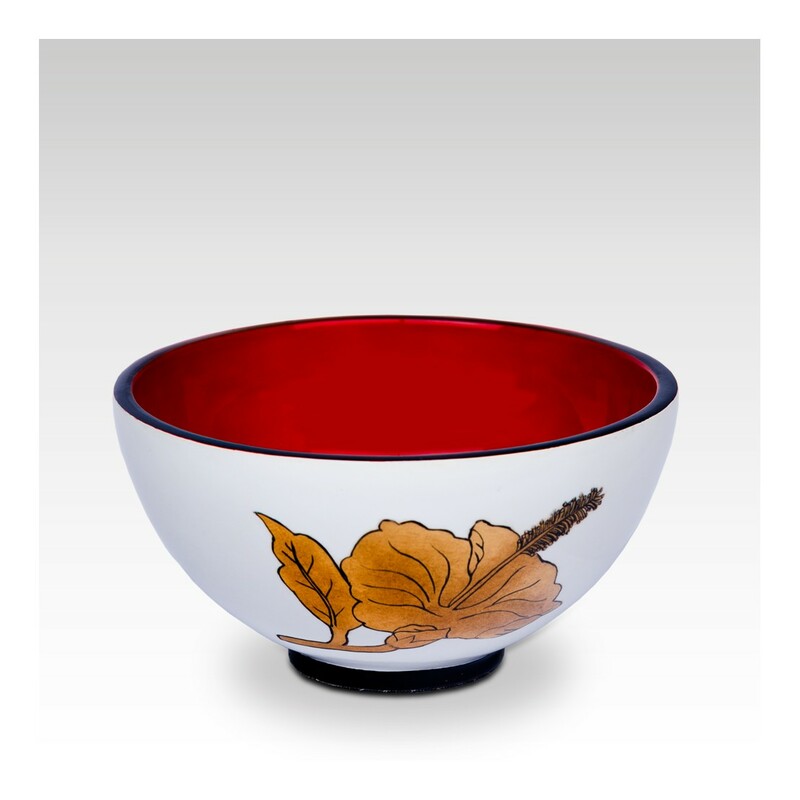 The Made in Cambodia Market is a dedicated to artisans and projects from Cambodia. It is open daily from noon until 10pm, and it includes stalls from Saomao and Rehash Trash amongst many other local businesses. 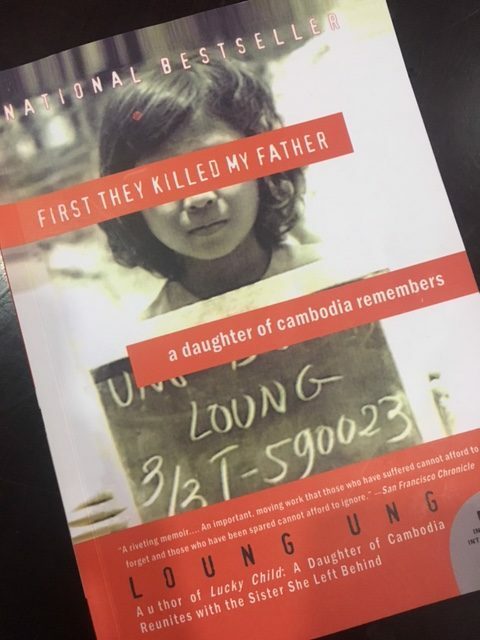 I read a book about a child’s experience in the time of the Khmer Rouge while we were there. It really helped me to feel empathy for the pushy tuk-tuk drivers and constant stream of street sellers, and to forgive the dusty and dirty streets that irritated me when we arrived. Reading the book and talking to local people helped me see how hard they are working just to have a reasonable life, as they rebuild their country from atrocities that are still fresh in people’s memories. It takes a long time for any culture to thrive after war or genocide. Cambodians receive no assistance from their government and education levels are often very low, so there is little opportunity for many people to earn money. The social enterprises, NGOs and other responsible businesses are really driving change to this situation, by focusing on education and skills they can use for life. I really encourage you to talk to local people and change-makers in Cambodia, and to read up on their history. The book I read is now a film on Netflix too, produced and directed by Angelina Jolie. Hearing real stories and gaining understanding for yourself is one of the best ways to travel with an open heart and mind. We enjoyed our stay in Siem Reap even with the difficulties we faced sometimes. We left knowing more about Cambodian culture, and knowing our visit had helped ethical initiatives make a difference to many lives there. We also left with new friendships made, and great appreciation of everyone working hard to ensure Cambodia has a brighter future. We hope you enjoy your travels to Siem Reap too, and you find even more ways to make your trip sustainable! Let us know your ideas and discoveries in the comments below. Are you interested in more ideas for travel in Cambodia? 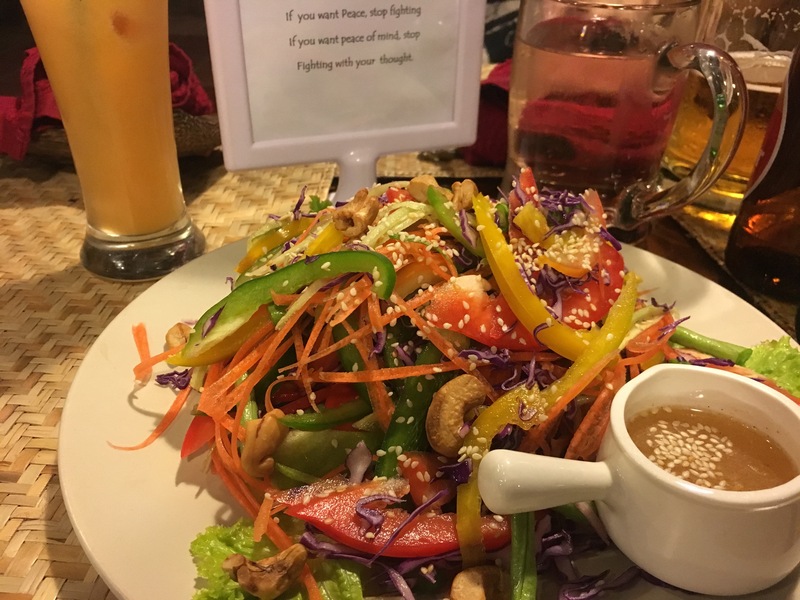 My friends at Dream Big Travel Far have a great post all about beautiful Kampot. 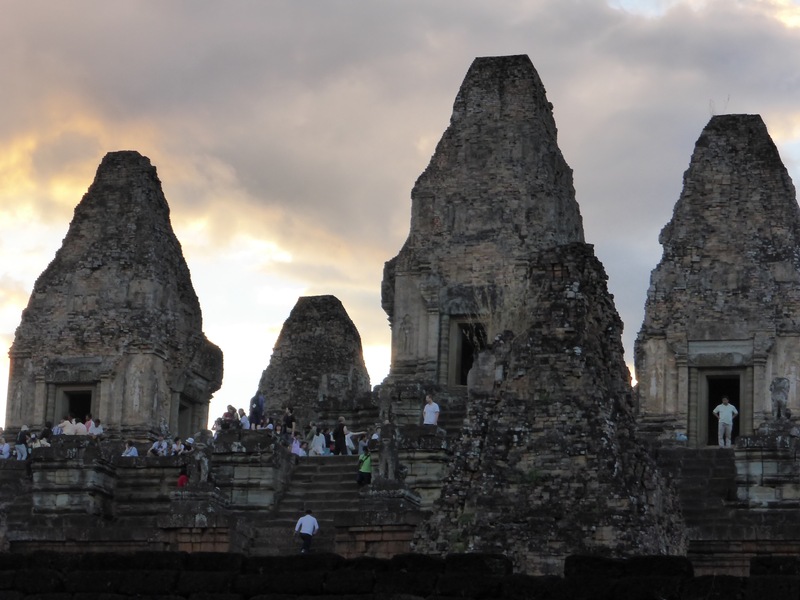 We will definitely be visiting on our next trip to Cambodia! If you found this post helpful, please share it or Pin it for later! Excellent write up! I’m glad to see so many ethical initiatives in Siem Reap. 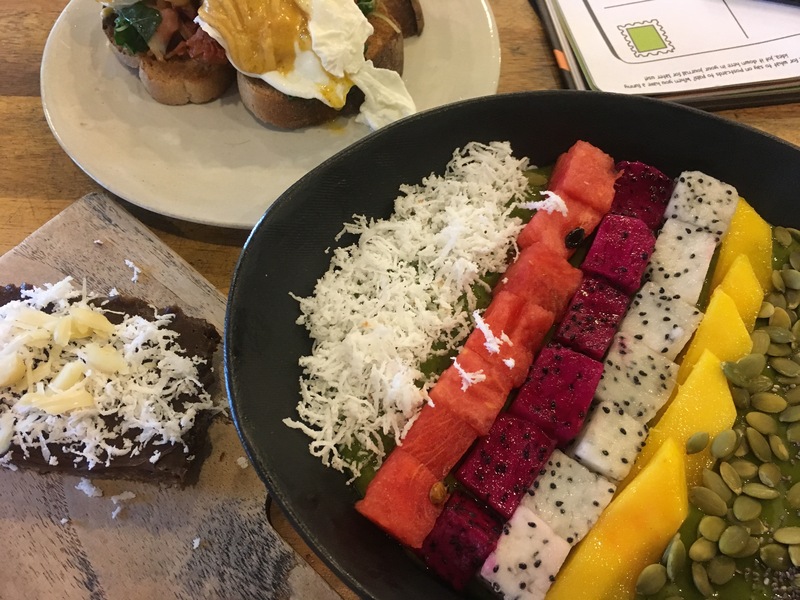 I stayed for a few weeks several years ago and loved Blossom cafe! Looking forward to heading back this year to see how things have changed. Thanks for all the great recommendations! Thanks for your feedback Rohan! Blossom cafe is awesome! Hope you have a wonderful visit again this year. You nspeak of responsible tourism …. not buying certain things and supporting others. Yet you advertise “Shark Fin Soup ” packages on your page. Fred, if you read my post on instagram about shark fin soup, you will see I most certainly do not endorse it. The facts about orphanages is so sad. I hope more people get the message! I loved reading about all the food! I was here a few years ago and loved it. I certainly would go back and try these restaurants! This was truly a great read. 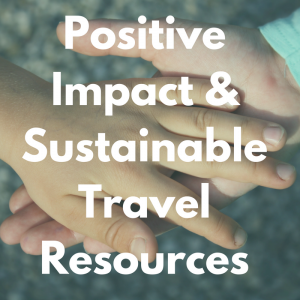 I love the idea of sustainable travel, but it can seem very overwhelming to even know where to begin. There were quite a few tips in this article that I hadn’t considered, like not buying from child vendors and seeking out attractions that are also teaching skills. I also really enjoyed the commentary on orphanages–I’ve never travelled to Asia, but I’m definitely going to do more reading on this topic! I wonder if similar things occur in other parts of the world. Thanks for all the wonderful advice! Thanks so much Michelle. 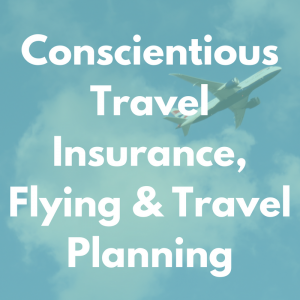 I’m glad it has helped you to see that it’s not always very hard: often responsible travel is just about making informed choices. I didn’t know about the orphanage issue until we went to Cambodia either, and I think it is a wider issue. It’s very sad but I’m glad research is supporting these kids, and information is getting out to tourists to think about what’s really going on. Thanks for your feedback April! Yes I didn’t realise all about the orphanage issues before visiting Siem Reap either. I’m glad to be helping raise awareness of it, and of all of the positive initiatives making a difference there too. Love it, thanks for sharing! Would love to vistinone day! Thanks Paola! It’s a wonderful city to visit, I hope you get there. 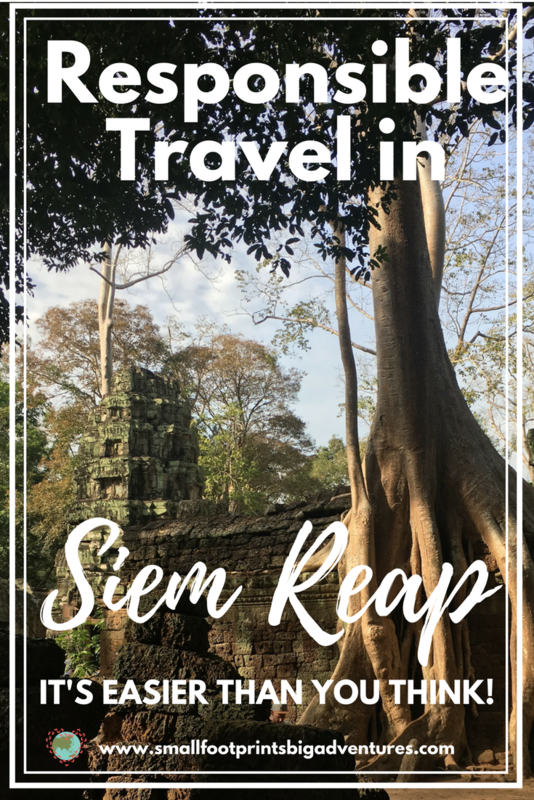 Thanks for a detailed look at responsible travel to Siem Reap. I’m happy to see that responsible travel is becoming more popular and raising awareness on these important issues. Thanks Susan. It is great that we can travel to such popular destinations and still have a positive impact there. Thanks Suzy! Such a shame about your camera breaking!! It’s a great place to revisit anyway, there’s so much to see just at Angkor Wat, and yes now there’s much more around Siem Reap too. Hope you get back there soon! This is a great write-up Emma! It’s very informative and all encompassing. I’m also looking forward to checking out Backstreet Academy. This a a great article, however when I wanted to check out See Cambodia Differently, I saw that there are providing elephant riding, which should be in no way acceptable (even if the elephant is in a sanctuary). https://www.seeasiadifferently.com/tour/cambodia-elephant-adventure/ . They mention that it is an “ethical elephant trek” but I don’t think there is any way an elephant ride can be ethical as elephants should have minimal contact with us (this is an interesting article:https://www.theguardian.com/travel/2018/aug/11/how-ethical-is-the-elephant-sanctuary-youre-visiting). Next story The best drink bottles for kids! Previous story Volunteering with our children at the Juara Turtle Project.